Angel of the Ascension, ca. 1261-1311, recently restored. Frankish fresco, main gate of Akro-Nauplion. Monuments of a Syncretic Society: Wall Painting in the Latin Lordship of Athens, Greece (1204-1311). An extraordinary diplomatic memorandum from 1418 gives a list of twenty complaints made by an ambassador of the Despotate, and twenty responses by the Venetian Signoria referring to events which involved the Palaiologos brothers, John and Theodoros. The memorandum was written on behalf of the Despot in awkward Italian: the Venetian clerk carefully reproduced the spelling and grammar of each item, and then gave the formal Latin response from the Signoria. The events had happened in 1416 when co-emperor John (Venetian sources call him “the young emperor”) was giving his brother Theodoros hands-on practice at war in the Morea. The Despotate was at war with the Prince of Achaia, and a thin strip of Achaian territory separated the Venetian territories of Methoni and Koroni. Territorial boundaries were disrespected. Venice had to request information from the Morea after receiving the complaint, information had to gathered and sent back, and the time lapse alone suggests the near-impossibility of handling these crises. Simultaneously, Venice was making complaints about raids into Venetian territory by the Despotate. This memorandum is five large folio pages long, too long to quote completely, but a partial and prejudicial paraphrase will convey the general situation. Despotate: What really happened in that riot is that our men were taking some of the men of the Prince (of Achaia). They insulted them, and the Despots came, and told them that . . .
Signoria: With all due respects to your ambassador, what happened is not like that. Your Despots were coming down this way to fight the Prince, and your men attacked our subjects and devastated our casale of Spanacori. They had given us warning of their coming and promised there would be no damage. Despotate: About the Albanians, the truth is that they were going to Koroni to sell a heifer, and someone told the castellan that they had stolen his goods and killed his pigs, so the castellan hanged them. Word got back. We have 6,000 armed Albanians up here -- the Despots were ready to take them to fight at Clarenza and then the news about Koroni came -- the Albanians wanted to go attack Koroni and it was all the Despots could do to prevent them! Signoria: Our castellan didn't hang your Albanians for a cow. He hanged them for the wheat, barley, millet, cotton, clothing, wine, and other things they had been taking at knife-point from our subjects in our territory. And your Despots were not going to Clarenza: John was on the other side of the Morea at Mouchli. Despotate. About the Methoni incident, the Albanians conscientiously did not go down there to cause trouble, but to rob in the Principality. They ran into 300 soldiers who attacked, wounded several horses, and killed one of them. So they got a little excited and misbehaved. Signoria: That's not what we heard. They came into our territory, insulted some of our people at Chinego who tried to defend themselves, then they attacked and robbed Chinego. The leader is a Greek named Koracha. Despotate. A man who lives in Methoni, a Piero Catalan, is a great friend of the Prince. He is responsible for the deaths of a number of our men because he has sold blades and crossbows to the [Principality of Achaia]. He has also provided bread and wine and supplies to the Genoese at Belvedere. He also went to Clarentza, took a number of Greeks, took them in irons to Methoni and locked them up. And then sold them to a Catalan ship. Signoria: We have no information on this. The export of weapons from our territories is not permitted. Had we known about the sale of the Greeks, our officials would have stopped it. Despotate. 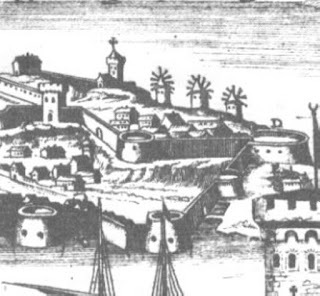 One of our rebels, Lamburcho, escaped from prison and went to Nauplion where he was given refuge, then to Koroni. This violates the peace you made with the old Despot (Theodoros I). Signoria: We have no information on this. We will look into it. Despotate. Some of your people have amazed us by trying to build fortifications on our territory. We are certain you didn't know about this. Signoria: We have no information on this. Nor do we believe it. Despotate. We built the Hexamillion with great expense, and called our people -- top ones and little people -- to work on it, but our villani complained and decamped into your territory, and that's not right. Signoria: Our territories are open and free to all comers who wish to live well, but if your serfs come our officials will send them back. The memorandum noted that on a previous occasion, the despotate had sent down a diplomat, Manuel Sophianos, and a certain David who inspected the damages in detail (“minute examinando”) and agreed with the Venetian estimate of loss. It also said that on this occasion the new damages did not need viewing and examination: it was just needed for the despots make restitution. The present memorandum continues for thirteen more items, providing a remarkable amount of information on aspects of life in the Morea, and dealings between the powers, and claiming attacks from Venetian territory against the Despot's people. It also makes clear that the Despotate had little effective control over its own people, whether merchant or criminal, even when it presumably had some interest in maintaining control. 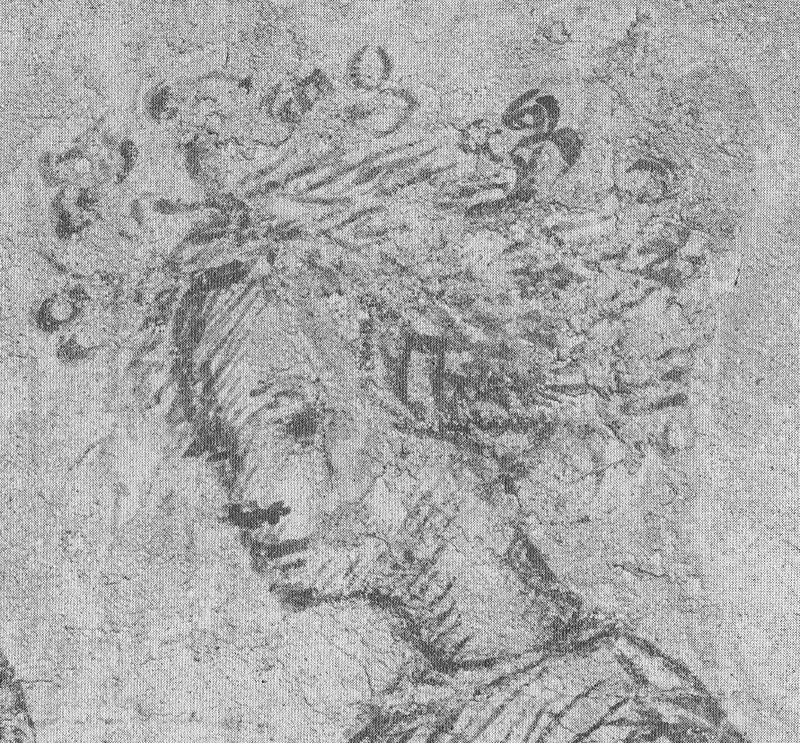 This image is the underdrawing, sinopia, for the fresco that I selected for an image of Cleofe Malatesta Palaiologina. 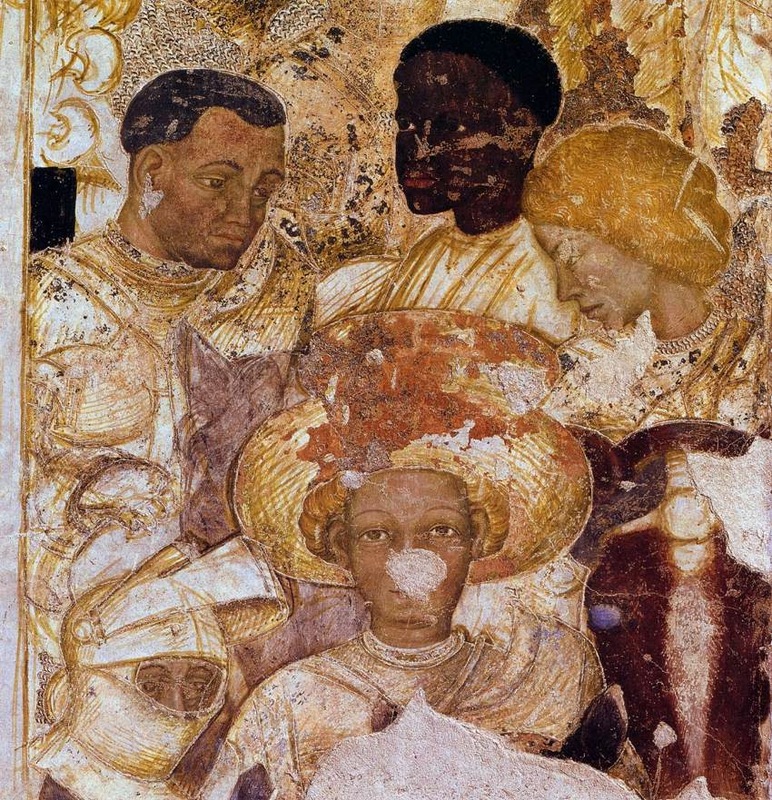 I selected the fresco in part because it is of the right date, in part because it is on a wall of her sister's palace in Mantua, in part because it shares features with portraits of other members of the family. I also selected it because it seemed to illustrate Bessarion's description that she knew she was beautiful, but that she didn't take particular care about it, and Pepagomenos' statement that she didn't pay much attention to what she was wearing. 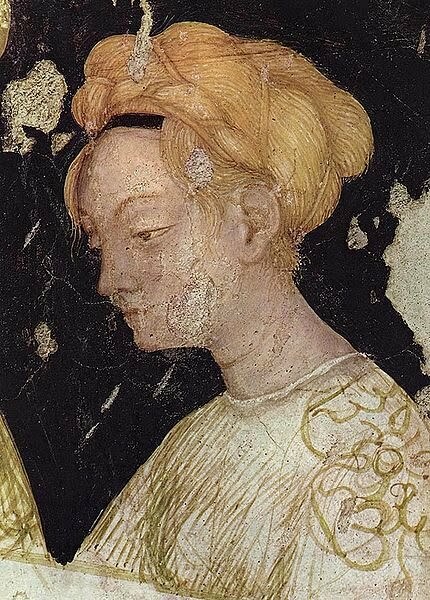 Paola Malatesta Gonzaga and her husband Gianfrancesco had hired the young artist Pisanello to fresco the four walls of the great hall of the palace with an Arthurian tournament. 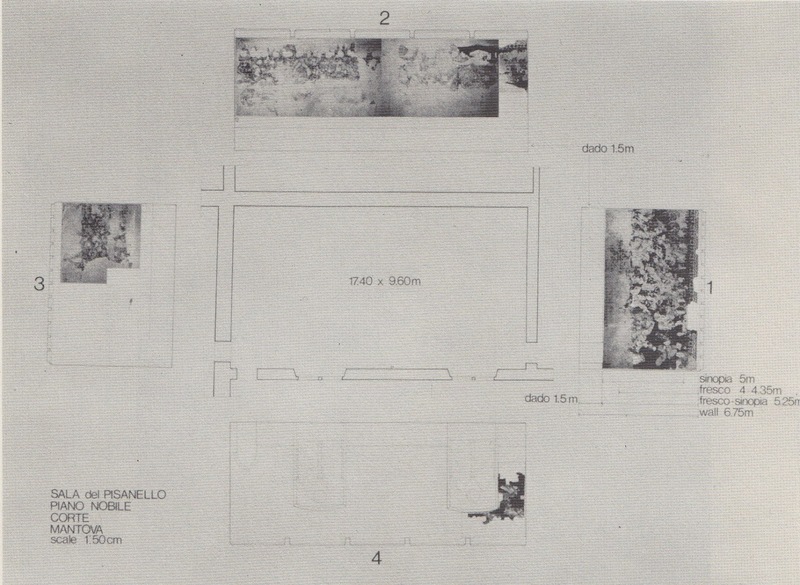 This is a map of the walls of the great hall with indications of the surviving frescos. 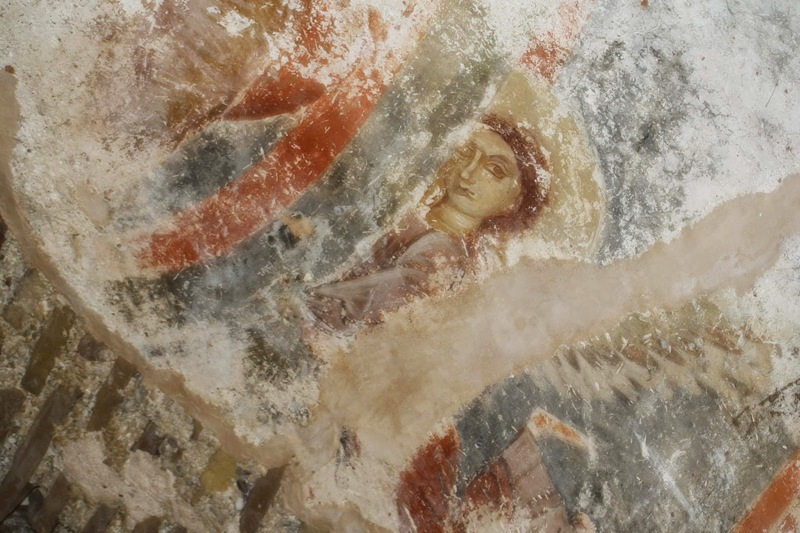 The sinopie have been removed and are on exhibit in another room: there are surviving parts of the sinopie that have not survived in the frescos, and vice versa. 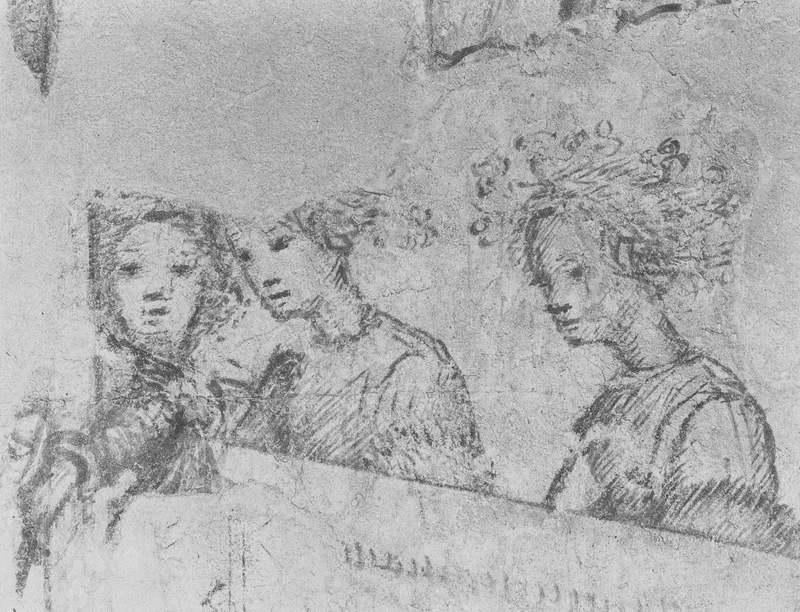 The fresco/sinopia of my interest is from Wall 2, at the right-hand end. 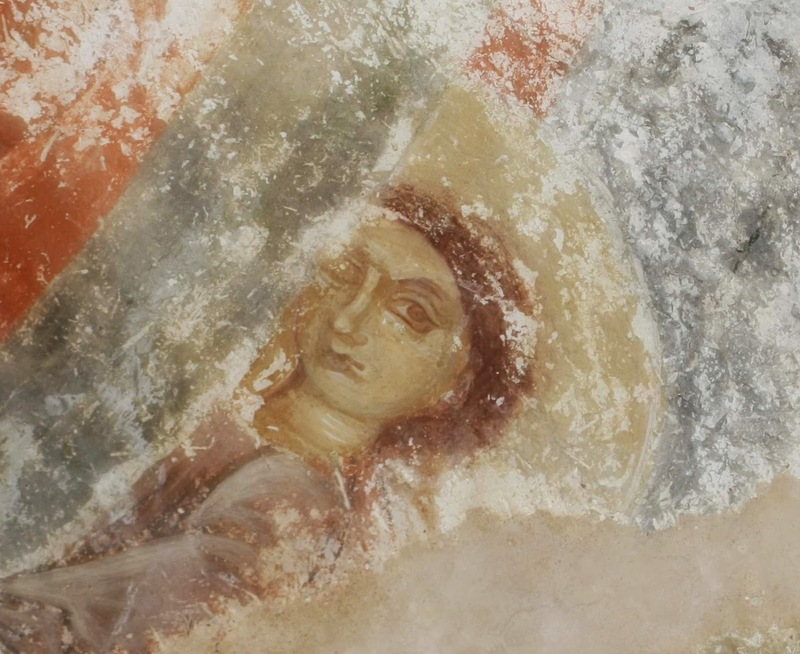 This is what survives of the fresco, and you can compare it with the image at the beginning. The frescos have been dated anywhere from 1425 to 1457, and each art historian can give good reasons for the chosen dates. 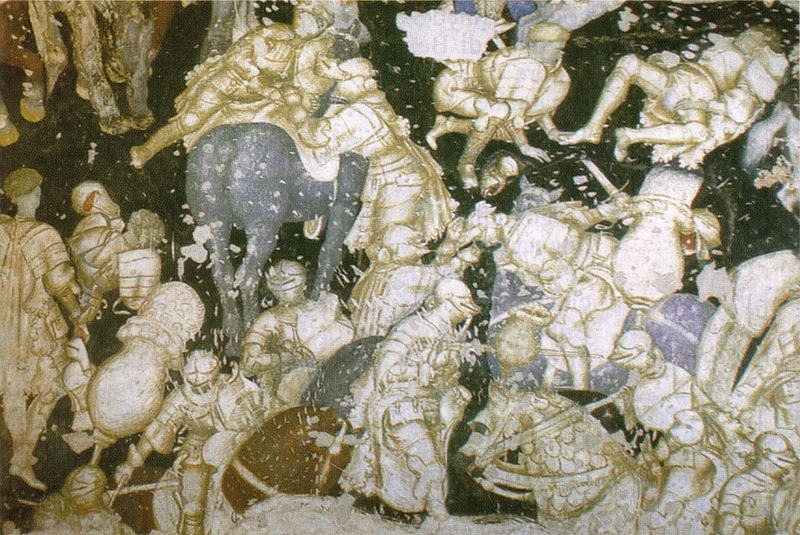 Joanna Marsden-Woods, whose work on the frescos I have found most useful, prefers 1443-1444. I have my own preferred dates. 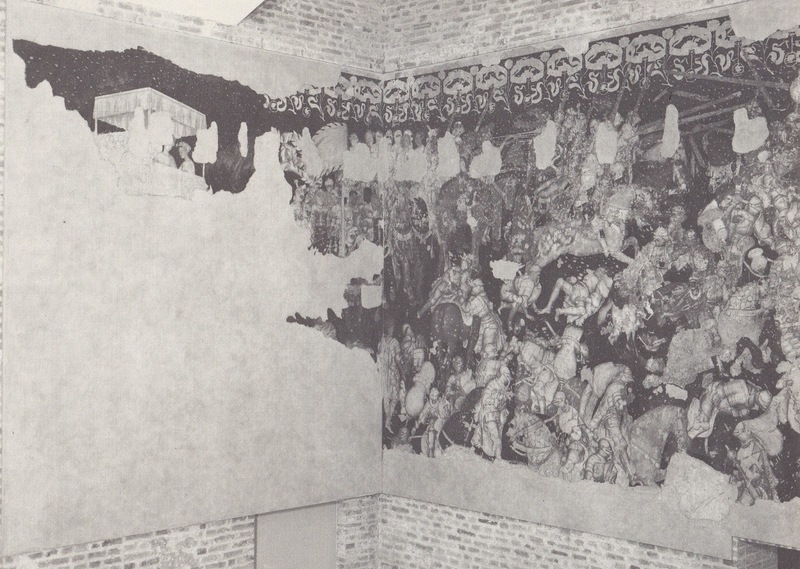 JM-W also gives the Arthurian story behind these frescos, which concerns an important tournament. The lady in question is under a canopy to the left of the image below. Indistinctly, there are some of the tournament figures to the right, on Wall 1. 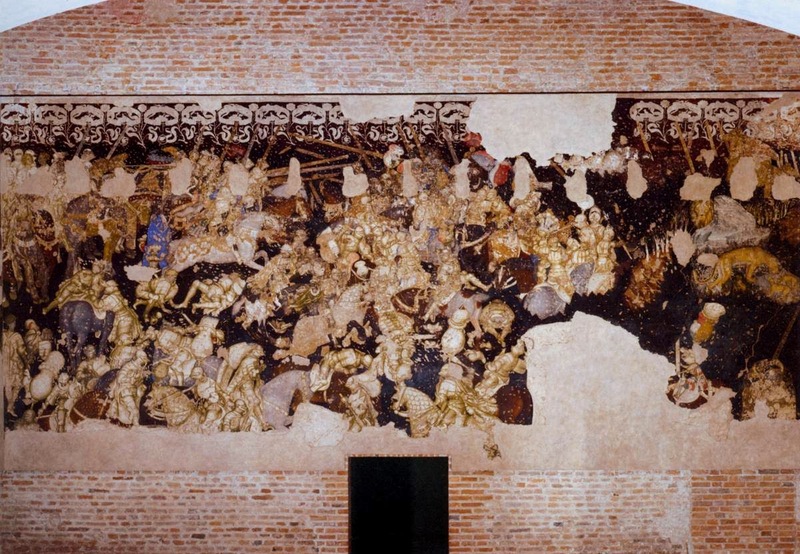 If you compare the heads of the figures with the bricks in the wall at the bottom, you will begin to get an idea of how small and dense the figures are. The tournament was given by a King Brangoire. The daughter of King Brangoire -- nameless in the story -- seduced Bohort, one of the three knights who accomplished the quest for the Holy Grail, at a tournament at her father's court, and by him had a son, Helain, who would become Emperor of Constantinople. Marsden-Woods does not explain what significance this story might have had for the Gonzagas of Mantua, or for her date of 1443-1444. My date is 1428-1429, a good 15 years earlier. But consider: in February 1428, Cleofe -- after six years of a marriage in which her husband had refused a sexual relationship -- had given birth to a daughter, Helena, the heir to the throne of Constantinople. None of the five living sons of Manuel II would father a son for twenty years. Might not Paola Malatesta Gonzaga enjoy having this painted reminder that she was the aunt of the possible future ruler of Constantinople? The co-incidence of names -- Helain and Helena (Eleni) -- surely cannot be accidental. I would like to see another element of the story as significant: Marsden-Woods says: "The love affair between Bohort and the princess, with its glorification of sexual passion, implied that a union between princes in real life could involve mutual passion and love." The sexual implication in the fresco is striking. If this Arthurian imagery effectively represented Cleofe's family's view of the sexual relationship, it is in fine apposition to the view of George Gemistos Plethon. This is the sinopia with ladies of many and wondrous hair styles watching the tournament. I cannot say if the nameless princess is one of the ladies in the lower tier, or the upper. I cannot say if the fresco was intended to portray Cleofe. I cannot say if Pisanello ever saw her, though dates and routes of his various travels would have given him several opportunities. I can say that I do most intensely hope so. 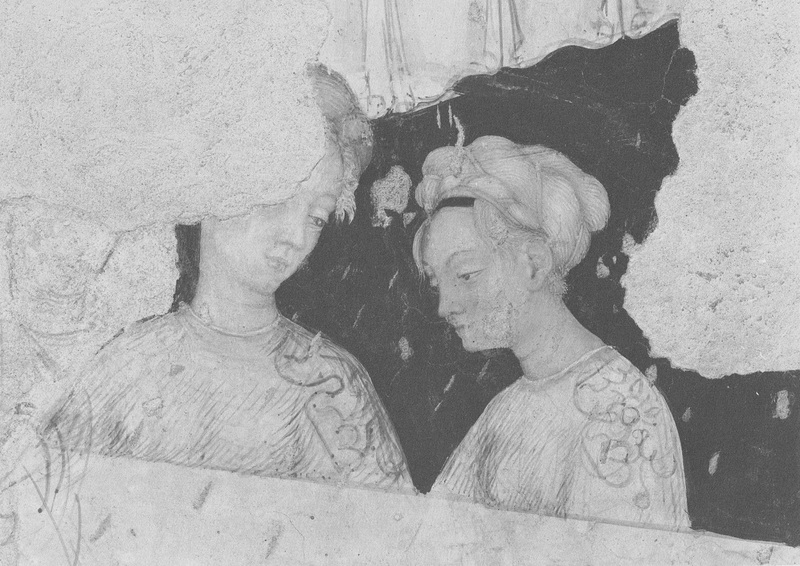 Some material and the black-&-white images are taken from Joanna Marsden-Woods' book, The Gonzaga of Mantua and Pisanello’s Arthurian Frescoes (1998). The color images are from Luke Syson & Dillon Gordon, Pisanello: Painter to the Renaissance Court (2001). 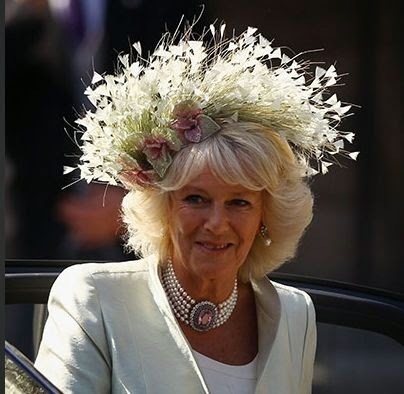 Bonus picture: Compare the sinopia drawing of the lady's wreath with the hat worn by Camilla Parker Bowles on her wedding day to Prince Charles who is quite knowledgeable about art. Marginal drawing, Book of Hours, Utrecht, ca. 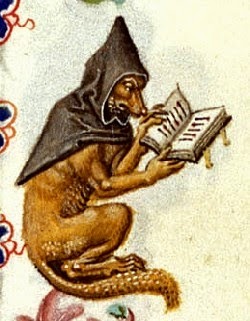 1460. Giorgios Sphrantzes finished "the account of the events that occurred during my wretched life," on 29 March 1478. He had introduced himself as "pitiful" and he was much to be pitied. He was seventy-six and a half years old, cold, aching from many years of rheumatism. Ten years earlier, he and his wife, penniless after lives in imperial palaces, had made confessions of faith and joined convents. In October 1476 he became desperately ill with an infection of the sinuses, ears, and throat. He was given the last rites three times. When it was clear that he would live longer, he was deaf for a long time -- he couldn't hear a bell tolling next to him -- and his feet were too painful to walk. He wrote. He wrote a priceless book in his own hand, giving us an intimate view of the important individuals and events of the last years of the Eastern Empire. There is much about it that is uneven and incomplete, but he apologizes, "as old age and infirmity did not allow me to finish my work properly." He placed the completed book in the hands of the priest Antonios. When you read it as a retrospective view, rather than as a contemporary chronicle, it is a book saturated in loss. It begins with death, that of Beyazid I and ends that paragraph with "Mehmed . . . who enslaved us and expelled us from Constantinople." The next event he reports is the humiliation of Manuel, to whom he was devoted, and then the birth of his beloved Constantine. Manuel's brother Theodoros dies, the Patriarch dies, then plague takes Sphrantzes' sister, her husband, a daughter, six servants, and then his parents die. He finds himself isolated, although he is firmly embedded in the imperial court, best friends with the emperor's sons, with responsibility for the emperor's wardrobe. It is with his first title, protovestiaritis, that he identifies himself at the end of his life despite the accumulation of further titles. When Manuel dies, John inherits his loyalty, and then Constantine begs John for Sphrantzes' services. He serves Constantine from the fall of 1428 until 29 May 1453, and as soon as he is able to free himself from slavery, he travels to the Morea to offer his services to Thomas, following him into exile. At the end of his book, he has outlived all Manuel's sons and some of their children, his own four children -- Andronikos died at 8 days, Alexios at nearly six, John was killed by Mehmed at the age of fourteen and a half on a charge of murder in 1453, and Tamar died about the same age of disease in Mehmed's seraglio in 1455 -- and his wife, and his remaining friend. In 1452 he had wanted to take John on a trip with him, and leave him in the Morea with family for safety, but the trip never came about. 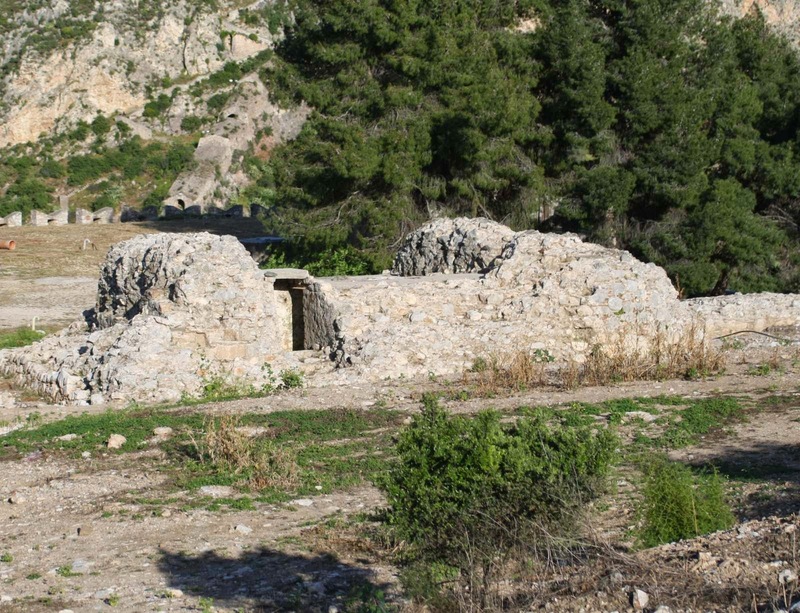 Tamar was to have married in the Morea but she was not old enough for marriage when travelling was possible. For all he has seen and done, little in his writing gives us images from his world. He refers to "silver-sealed" documents and Constantine signs a marriage agreement "with his own hand three crosses in red ink on the upper part of the document," but the silver and red ink are for him signs of authority, not images. But there are a few, in the section of his book with the most detail: the scene outside Patras where he and Constantine are pursued on horseback in a skirmish. Constantine fell, Sphrantzes defended him, he escaped, and then Sphrantzes and his horse were cut down. Sphrantzes was taken prisoner and "thrown into the dark tower of a house, full of ants, weevils, and mice, as it was located in front of the grain storage." When he was finally freed from prison, half-dead from wounds and starvation, Constantine sent him "an expensive double green tunic lined with fine green linen . . . a red cap decorated with gold . . . a heavy, gold-colored caftan from Brusa, a green coat, and a finely worked sword." And there is his isolated description of 25 January 1470, desperately sad when you think of what it implies: "so much snow covered the whole island of Corfu as no local inhabitant had ever seen. It was even possible to catch foxes and hares by hand." A correspondent was recently in Nauplion, and thoughtfully sent me a report and photographs of what he saw on Akro-Nauplion. He has agreed to let me share it here. This is from publisher and writer, Allan Brooks. New work seems to be in progress on the Frankish gate and its frescoes. A corrugated iron roof has been placed above the gate to prevent more water damage and the whole area inside the wall (originally occupied by the military hospital) is being excavated. I was able to take a surreptitious look inside the gate chamber and was surprised that several elements of the frescoes are still visible. More work is in progress around the west wall of the castle of the Franks. This has been cleared revealing the base of the great square tower in the centre of the wall and the surviving masonry is being consolidated. I had a look at the second walled up gate. The garden below is now more manicured (and the house appeared un-occupied) but the views from above and below are essentially the same as your photographs. However I discovered that the gate can also be seen from the Palamidi steps. From this point it seems as if the terrace that accommodates the road through the northwest gate of the Castel del Toro (reached via the steps past the catholic church) continues along the flank of the hill as far as the second gate (although the modern lane itself stops about halfway). Is it possible that the old image showing the approach to the gate parallel to the shore is correct (the third image in your post; The Second Gate Revisited, and Another) and that steep steps directly uphill were not the approach? [DW: I don't think so.] 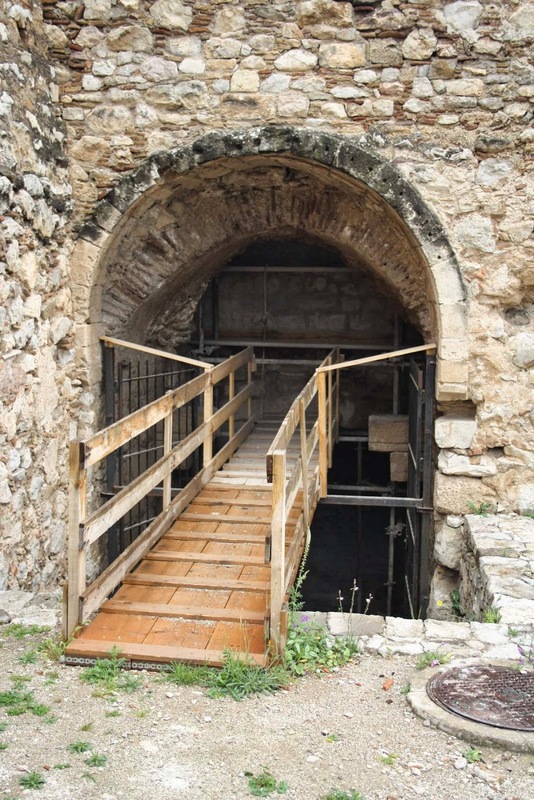 The creation of a new second gate giving access directly into the Castle of the Greeks must have had real practical value. Presumably the gate was re-modelled when the Dolfin bastion was built in 1703/4 and only walled up when the Sagredo gate was completed in 1713. The gate of the grotto must be the walled up entrance that now stands six feet above the modern concrete footpath about eighty yards beyond the gateway below the Five Brothers bastion. The area inside the wall where the descending steps would have been is now occupied by a concrete box structure full of derelict equipment. 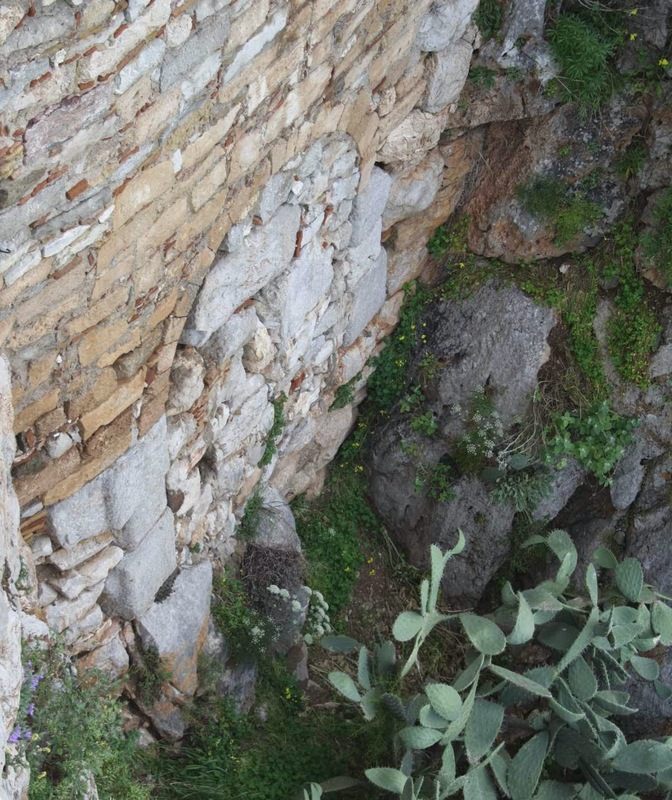 I managed to find Morosini’s postern and took a photo of the walled-up outer face by hanging over the adjacent wall. On the inner side steps must have descended to the gate but the area is now completely filled with rubble to a height above the gate arch with a good growth of prickly pear on top. 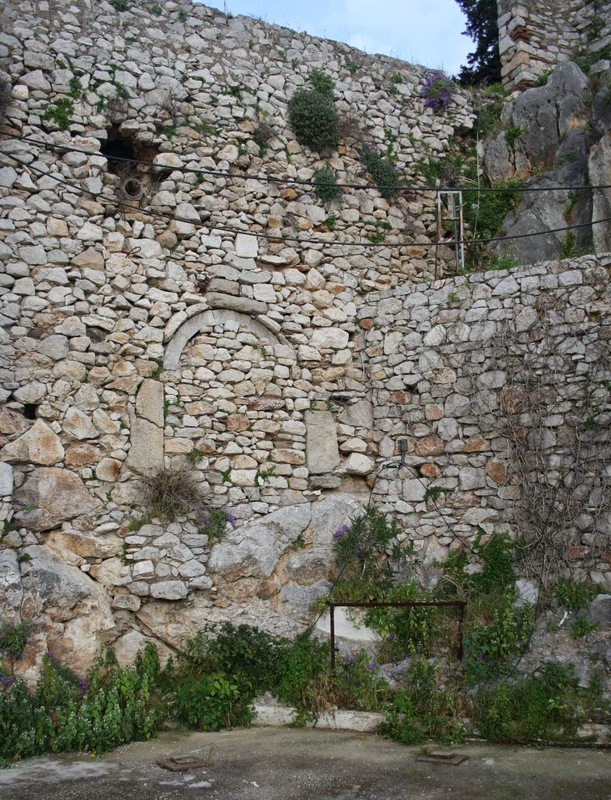 The gate is exactly where it is shown on the Grimani plan but I couldn’t see any trace of the rock-cut steps from either above or below. The Sagredo gate is now in worse condition than ever. 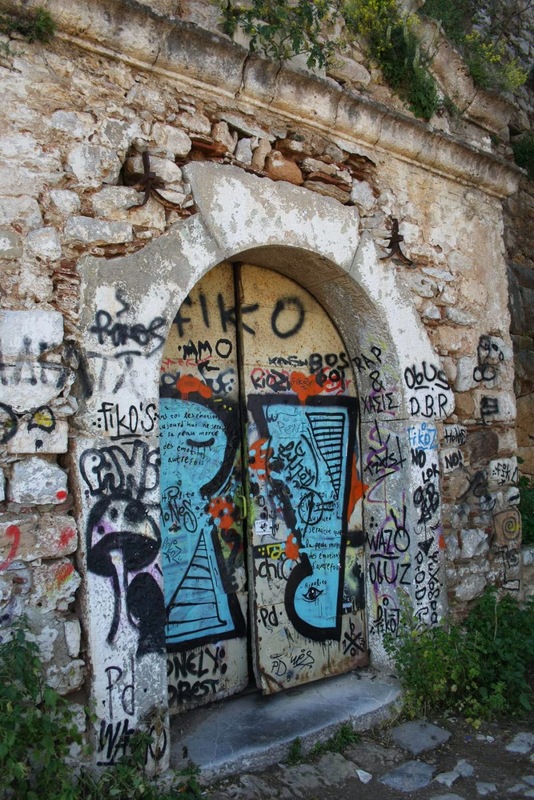 The attached photo shows it almost obliterated with graffiti. 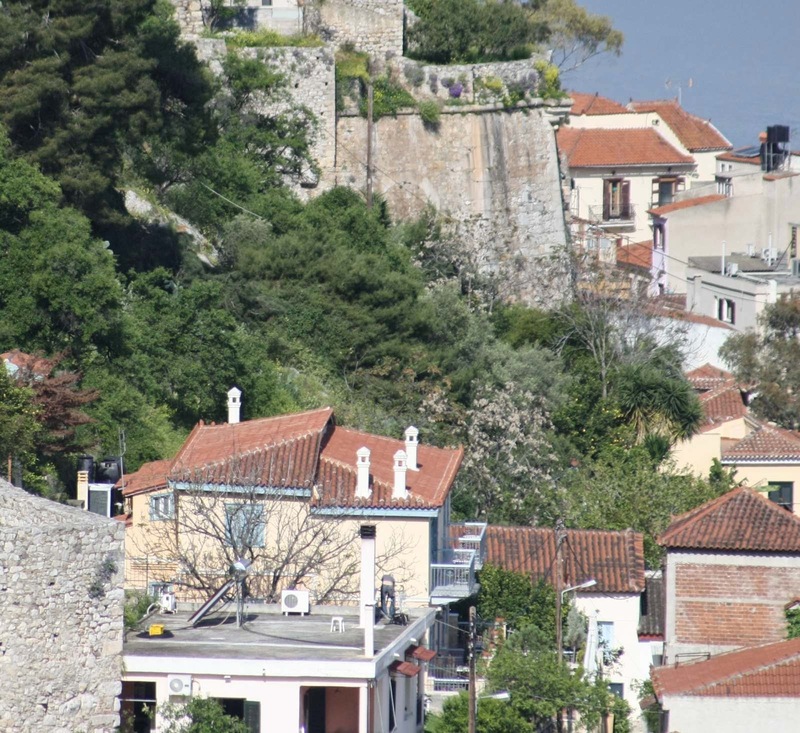 In fact the whole of Nauplio is suffering from this blight.